← Detective Comics #461: the Dark Knight Bicentennial Banner blog continues! It’s a bird … it’s a plane … it’s …. a Bicentennial Banner blog! Action Comics? Really? You need me to give a background of Action Comics? Okay, okay … Issue # 1 was cover dated April 1938 and featured the debut of that literary iconic trope – the superhero. He was and is called Superman. He was not a masked crime fighter inspired by the pulps like Crimson Avenger, but more in line with the pulp’s Doc Savage or Hugo Danner (the prototype superhero from the novel “Gladiator” by Phillip Wylie) in that he was a perfect human specimen. Only a bursting shell could pierce Superman’s flesh; he was faster than a speeding bullet, more powerful than a locomotive, able to leap tall buildings in a single bound. Look! Up in the sky! Rather than a Doc Savage clone, he wore a colorful costume and cape ala the pulp detectives of the day. He was a hybrid of these two styles of hero and transcended them both. 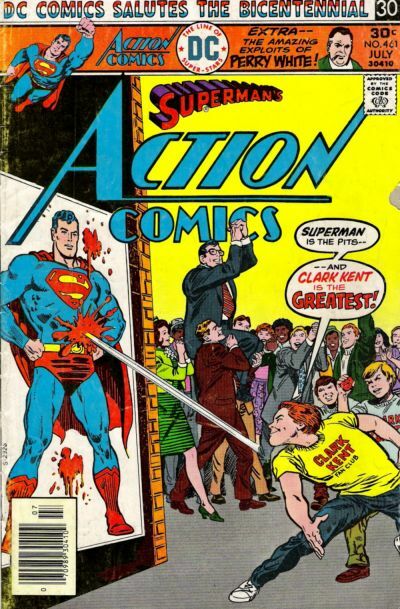 Superman was on the cover of the first issue (in the iconic pose of his smashing a car to bits) and did not appear on the cover again until #7, and then again not until #10. But based on the sales of the issues on which he WAS the cover feature, the star of this anthology comic was obvious. After #13 he was on the cover (even if it was just a blurb) on every issue until the 1980s, when it changed to a weekly format. Action Comics also saw the debut of Lois Lane and Superman bad guys Lex Luthor, Brainiac and the Parasite as well as other DC/National heroes such as Zatara, Vixen (although she should have debuted in her own comic cancelled in the DC Implosion) and Supergirl. 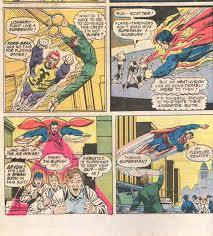 This story is continued from the previous issue and continues in the next, concluding in the issue after that (where Superman, with amnesia, witnesses the signing of the Declaration of Independence – the comic that was actually on the stands on July of 1976 as opposed to the cover date). Still, with a little manipulating it could have had the Bicentennial banner, yes? I owned the next two issues after this when they were published. Villain Karb-Brak is convinced Steve Lombard is Superman and attacks him. Superman, meanwhile, saves a Senator from flame-thrower-wielding terrorists and hies to the Galaxy Building just in time to save Lombard. They battle. As in the previous issue, Superman gets feverish around Karb-Brak, who touches Superman and causes the gym in which they fought to explode! Superman saves Lombard and Karb-Brak. Karb-Brak, in his human identity of Andrew Meda (get it?) walks away. Karb-Brak reveals his origin: He is banished from his home planet in the Andromeda galaxy because he is allergic to everyone on the planet – a planet of super-powered beings. But the planet of his exile – earth, obviously – has a being whose powers are similar to his own. When Superman approaches, he becomes allergic. If he does not eliminate Superman, he will die. With Lombard no longer on his list of Superman’s secret identity, Karb-Brak goes to suspect #2: Clark Kent. Using his psi-machine, Karb-Brak mentally manipulates Clark’s friends and other citizens of Metropolis into falling in love with Kent. They fawn over him, want pieces of his clothing and treats him like a 1970s rock star. Kent is chased into a park and attacked by Karb-Brak, where Clark accidentally hurts bystanders while protecting his identity. His guilt and concern hold him back as Karb-Brak continues the assault. The crowd cheers on Clark Kent – they now realize he really is Superman – and he fights back. The psi-machine worked too well. Karb-Brak returns to his psi-machine to make the public cheer him instead of Kent. Superman knocks out Karb-Brak, and uses the psi-machine to make the public forget his dual identity and the fight in the park. 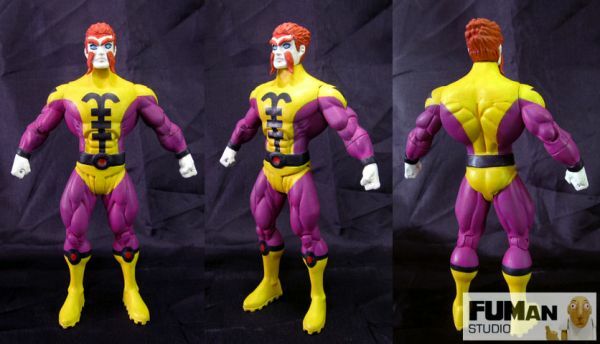 Karb-Brak is now too weak to fight Superman and gives him an ultimatum: stay on earth and I die or leave earth forever and let me live – which will you choose, hero, which will you choose? This is a solo Perry White story. Perry was the editor-in-don’t-call-me-chief of the Daily Planet – Clark, Lois and Jimmy’s boss. He first appeared in November 1940 in Superman #7. Before that time, Lois and Clark worked for George Taylor of the Daily Star. The explanation of the switch was never given at the time, but retconned in the 1970s as part of the Earth-One and Earth-Two lore. After Easter dinner, Perry’s gathers his four grandchildren to tell them of his amazing exploits. In 1934 Perry was hawking papers when a man gave him a quarter for a two cent edition! Perry recognized him as missing toy company heir Victor Larson. Perry followed Larson to his office where he kept a man named Doctor Norton hostage. Victor ran up gambling debts with the mob and is in hiding; Norton has designed an atomic bomb and Larson is trying to torture the plans out of him. Perry jumps through the window and eventually knocks out Larson. Poor Norton dies of a heart attack in the meantime. Perry writes his first story (the atomic bomb angle was nixed) and got a job reporting for the Daily Planet instead of selling it. One newspapers headline (partly covered) touts “Giordano wins art …” The editor of this Earth-One Daily Planet was not named in this story – was it George Taylor? Superman in Action: letter column for Action Comics #457 (which introduced Pete Ross’ son Jon). Brian Scott of Streator, IL (positive), Mike White of Mackinaw, IL (positive), Mark Schneider of Concord, Mass (negative as to the Superman feature, but positive on the Green Arrow back-up), and Dan Cardenas, San Luis Obispo, CA (positive) contributed.